Twice a year, every year, for the past ten years, we drive 850 miles from New York to South Carolina to spend a week at the beach. It’s a long drive. With two kids in the back, singing Adele a capella, it’s a really long drive. We try to do it in one shot with just one stop: Sally Bell’s Kitchen, two minutes off the highway in Richmond, Virginia. Their famous lunchboxes, which they’ve been packing since the ’50s, are almost worth the trip alone. We buy four, then walk to a park nearby to sit in the sun, stretch our legs a bit, and eat. Inside each box is a happy meal from another, better time: a Smithfield ham-and-iceberg sandwich on a roll, a paprika-dusted deviled egg wrapped in parchment paper, a two-bite cupcake (You get three choices: chocolate, almond, or caramel) that is frosted on three sides, a cheese crisp, a packet of Duke’s mayonnaise and, best of all, a small paper cup filled with super-eggy potato salad and topped with a lone sweet pickle chip. Hot damn! While the girls love the salty ham with mayo and the novelty of a cupcake that’s more frosting than it is cake, it’s the whole package—and the act of unwrapping of it—that blows their small minds. The white cardboard boxes, tied with bakery twine and lined with checkerboard tissue paper, are prizes they’ve earned by enduring four hundred miles lashed to their booster seats, watching I-95 roll by, and being force-fed Dad’s music. The food is real and great and they love it, but they also love what it represents: the trip is halfway done, and the next time we stop, they’ll be in vacation land, with all its attendant promise. This is our “Providers” column from the May 2012 issue (The Travel Issue!) of Bon Appetit — on newsstands today. 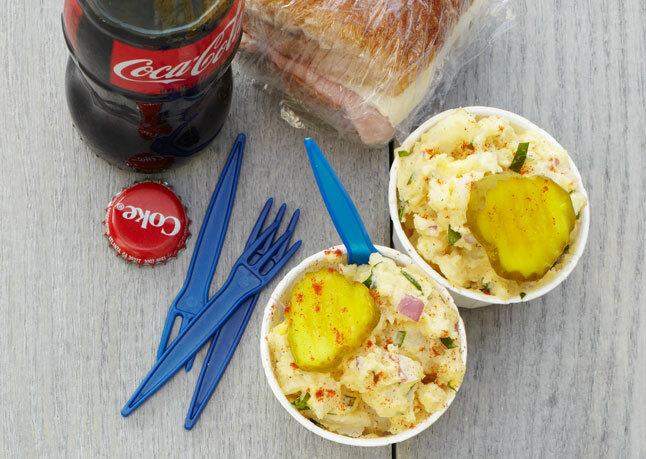 Please head over to their site for the Eggy Potato Salad with Pickles recipe and to access the entire Providers Archive. Photo by the amazing Marcus Nilsson for BonApp. I LOVE Sally Bell’s Kitchen! It’s just down the street from my office and I just walked to get a boxed lunch there yesterday! You’re so right about how wonderful the lunches are to unwrap and how real and good the food is. Thank you for bringing some national attention to one of the wonderful restaurants in our great city of Richmond, VA! We make the same drive to Pawley’s every summer from PA. However, we miss all of the good places to eat, we pack the four kids into the car at 11:00 pm and drive overnight. If we ever do a day run, we will have to hit Sally Bell’s Run. We are always looking for somewhere new and good to try. I am a Richmond girl and am so glad you have discovered the wonderfulness of our Sally Bell’s! It is a truly special place and their chocolate/chocolate cupcake is heaven. Love the mental picture of your girls delight over a ‘real food’ happy meal – we need more Sally Bells! Thanks for the potato salad recipe too – looks delicious. Fun to see you featured in Bon Appetit! Oooh–this reminds me of the lovely lunches in “Bread and Jam for Frances.” Tell me the boxed lunch comes with a doily and a tiny vase of violets! As a Richmond transplant to Brooklyn, I love and miss Sally Bell’s! When I’m at my parents we often get boxed lunches and have a picnic. We make that 7 hour drive often, although we bypass 95 and go 301 (slightly slower but WAY better sights and food along the way). Love the thought of starting our trip home to NYC with a Sally Bell’s lunch, brilliant! Don’t your kids have any issues with all those eggy parts? I mean, deviled egg, eggy potato salad, this is quite a lot for 2 egg haters! nancy – yes, that’s why theirs is the “slightly less eggy” version. I don’t think they know that there is egg in there. for them, the egg issues are more about a runny yolk or a slippery, jiggly scramble. Thanks for posting this! We’re moving to Richmond next month, I can’t wait to check this out. Ah Sally Bells! A box lunch may need to be lunch today. The ladies get there at 3 or 4 AM and make everything, even the mayo, from scratch each day. I love the sandwiches, the potato salad and cupcakes but the cheese wafer with the pecan half on top, priceless. Made this last night and it truly was the yummiest potato salad I’ve made, and simple to boot. Love the creamy texture and the perfect balance of tangy sweet, salty goodness. I’m tossing out all my other potato salad recipes. Just a thought….next time you’re passing thru Richmond, order the jello salad (it has canned fruit in it) instead of the potato salad for your kids. It might appeal more to their tastes. I order it from time to time and love it. Also, instead of the cupcake, next time try one of their pecan tarts. They are out of this world delicious and huge (big enough for two people to share). And while I am making suggestions, you and your kids would have a grand time having your picnic at Maymont Park. There is a children’s farm, wildlife exhibits and a nature center. This place is absolutely breathtaking and worth a stop (and only a five minute drive from Sally Bell’s). We make the trip from DC either UP 95 (to CT) or down 95/26 to charleston. I just wanted to comment on your potato salad. I used the recipe from the DALS book. oh, wow! Big hit for our Memorial Day celebration! !